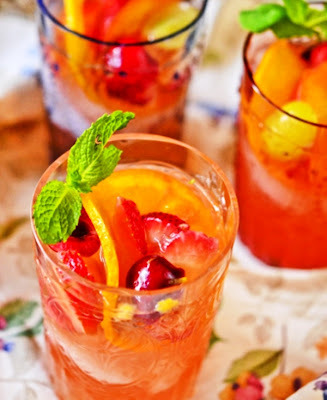 In a large pitcher, mix the white wine and orange liqueur. Add the peaches, strawberries, orange slices, grapes and cherries. Stir often and reduce down to about half, or until you have about a cup of syrup, 5-8 minutes. Stir in the simple syrup prior to serving and sweeten to taste. Serve over ice and garnish with fresh mint if desired.